TO MY MOTHER – HAPPY 93rd ! I’ve been on vacation the past several weeks and haven’t made a posting in a while. I thought I’d make a departure from my usual sort of ancestral postings this week and wish my Mom Happy Birthday. She turns 93 this Saturday. Wow! That’s amazing. It’s hard to even imagine the world she was born into almost 100 years ago. In this posting I thought I’d let her tell us in her own words what her birth day was like. The piece that follows was written by my Mom while she was taking a life writing class probably about 1985. She titled it Family Homestead. To find the area where I was born you must get a map of the state of Wisconsin. Locate the southern tip of Lake Winnebago and follow highway 45 southeast to Campbellsport, Wisconsin. Travel six miles east of Campbellsport until you come to a tiny village called New Prospect. Stay alert while driving because this town is still so small it is easy to miss it. It consists of 2 taverns, a garage, a repair shop, a store and a house. A scant distance out of town are a few more houses. Upon reaching New Prospect turn north on the narrow dirt road between the two taverns. Cross over two small bridges under which flows a very small tributary of the Milwaukee River. Go over a slight hill and at about 3/4 of a mile to the end of the road you will be at the spot where my parent’s (and my mother’s parents) had a diary farm. It was here that I and my four siblings were born and raised and lived until adulthood. I arrived on May 31, 1921, the third child of George Herbert Meyer and Rosalia Ann Uelmen. My brother John, born Dec. 12, 1917, and Gertrude, born July 24, 1919 were there to welcome me into the world. I was a big baby. Babies were weighed on household scales at that time and were none too accurate. My Mom and Dad never tired of telling what a husky baby I was at over 9 lbs. This seemed rather spectacular to them because my brother John was born prematurely. No one ever weighed him but he must have less than 4 lbs. My sister Gertrude was a tiny 6 lbs. Everyone who gazed upon the new Meyer daughter predicted I would be the big strong one of the family. Imagine my parents surprise that I ended up the small, fragile one. It always seemed to amaze my Dad that this could be so. I love having a May 31st birthday. Nearly everywhere, but especially in Wisconsin, it is such a beautiful time of the year. Birds nesting, flowers and plants sprouting anew! What a delightful time to celebrate new life! I have to agree with her last statement. May is a fabulous month brimming with the celebration of new life. Happy Birthday, Mom! I love you! 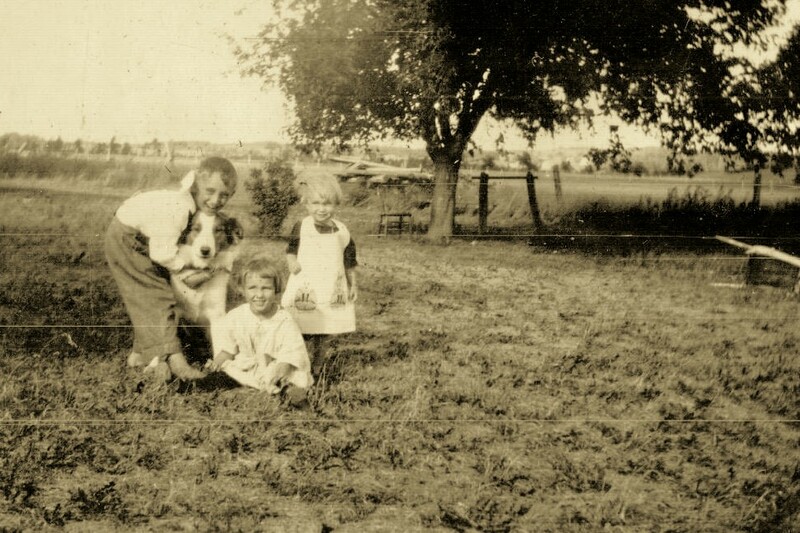 This entry was posted in Uncategorized and tagged Gertrude seated on ground and my Mom standing on right., The eldest three Meyer children - John on May 29, 2014 by kwriter13.